Almost everything about Pugs you can think of is written about here at the I-Love-Pugs website. If you’re wondering if a Pug is for you and what type of personality this dog has, you’ll find that information here. 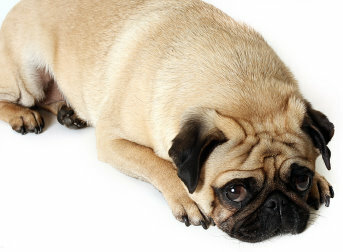 If you’re looking for a cute, lovable companion you almost can’t do better than a Pug. They will definitely be your companion and seem to like nothing better than to be with you. Before bringing your Pug home we can provide you with a list of supplies and give you some tips on how to socialize your Pug to his new home. If you have questions about training and behavior problems we can lead you in the right direction and answer many of your questions. We try to answer as many questions and offer as much information as possible. If you have any suggestions for what you’d like to see on these pages please contact us because we’d love to hear from you! Please make sure you download your Free Pug Report It’s full of valuable information for anyone who has a Pug in their life. At I-Love-Pugs we try to cover every phase of a Pug’s life. Anyone who has a Pug knows how much they love to eat. These little guys are an eating machine. We’ll provide some great information on dog food and nutrition as well as some tips on healthy snacks that almost every Pug seems to love. Almost everything about Pugs that you need to know is right here. If Pugs are really a big part of your life you’ll find sections on Showing your Pugs as well as information on other Pug activities . You’ll be amazed at the range of things you can do with your Pug. Check out the Canine Good Citizen program if you want to have a Pug with model behavior and, if you like taking pictures, you’ll find out why a love of Pugs and photography are a great match. One of the things many Pug owners tell us is how many great people they meet as part of being an owner and joining one of the many clubs and activities that are available. One of the best types of organizations are the Pug Rescue groups that have come into existence. These are volunteer groups with a mission to rescue Pugs from stressful and unhealthy situations. We cannot say enough about the wonderful people who volunteer in this very worthwhile cause. They do great work! When you make a list of everything about Pugs that you might want to know, you might also want a little insight into the negatives about owning one of these adorable dogs. When you do that, shedding usually comes up pretty high on the list. It is true that Pugs will shed a lot and if someone in your house is prone to allergies you may want to think twice about Pug ownership or get an amazingly strong vacuum cleaner! In listing some of the negatives, you might also want to include the fact that Pugs don’t like absentee ownership. They want an owner who will be a companion and who will want to spend every waking minute with them! The Pug Breed has high standards and this is part of everything about Pugs you might want to know. Everything about Pugs from an appearance standpoint has been covered by the American Kennel Club. They set the standards for the breed and breeders use these guidelines as a benchmark to measure the quality of the offspring their Pugs produce. We cover a great deal of information about breeders on these pages and encourage you to do your research in choosing a breeder or veterinarian. Pugs are adorable little dogs that have a unique history as well as a unique set of physical characteristics that make them prone to some health issues. The most prominent on is their respiratory system. Their short face that makes them so adorable also makes them prone to some breathing problems. Most Pugs make some pretty interesting sounds and snorting and snoring are part of their repertoire. They have problems in heat so physical activity on summer days is not recommended. They can overheat easily. As part of everything about Pugs you need to know we give you some health care tips as information on first aid and safety. Pugs become a part of your family from the first day that they enter your life. In fact, many owners choose a name based on their first experiences with their new family member. We love to hear about Pug names and how people choose a name for their little friend. We’d love to hear your story and might include it in our site. We think it’s an important part of everything about Pugs people need to know. Thank you for visiting I-Love-Pugs. Please let us know how we might serve you better and make sure you get your Free Pug Report.